…exactly the purpose of the Bible, presented in a kid-friendly way. This is BY FAR my favorite children’s Bible. Most children’s Bibles tell a simple story of Noah building the ark or Jesus healing the blind man and leave it at that. They give no attempt as explaining WHY these stories are important for us. They miss the meat of the message God has for us in the Bible. 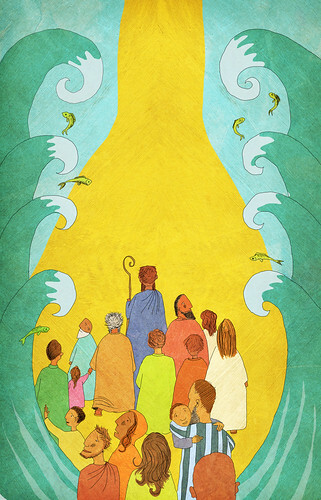 The Jesus Storybook Bible goes above and beyond others by giving the big picture. Starting with God creating us to “share his Forever Happiness” to God remaining firm in His “Never Stopping, Never Giving Up, Unbreaking, Always and Forever Love” even after Adam and Eve’s sin to His promise to come back for us, to rescue us, and finally to His arrival on earth, putting His resuce plan into action. “He was going to get His people back.” Each story foreshadows the coming of Christ, explains the reasons for His coming and the purpose for this time we live in today, between His ascension and His final return. Honestly, that’s a deep message. Amazingly the author, Sally Lloyd-Jones, explains this message in a way a child can understand. “The Bible isn’t a book of rules, or a book of heroes. to rescue the one he loves. I am confident you will adore this children’s Bible as much as I do and as much as J does. Oh and they also have an audio version if you purchase the deluxe edition. I don’t have this yet, so no personal experience with that portion. It’s on order though, so stay tuned for my thoughts on that too! This is a fun addition to lunchtime. It’s so easy and your toddler will enjoy it. 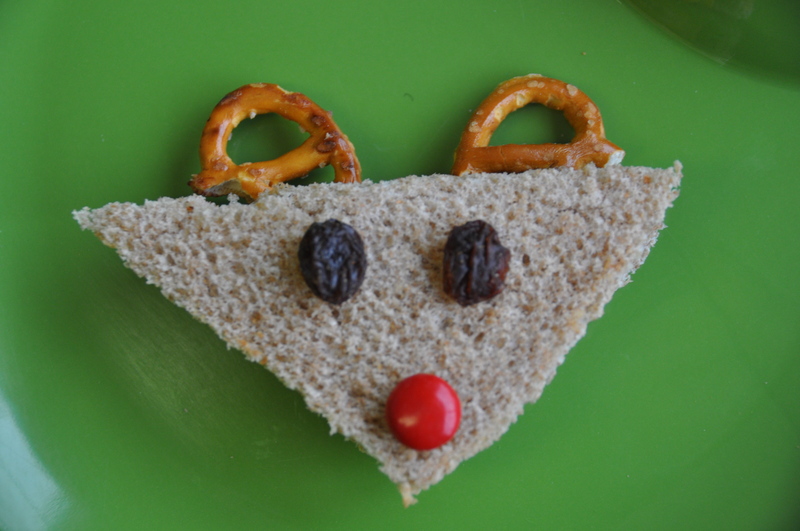 Simply add two antlers (pretzles), two eyes (raisins or chocolate chips) and a red nose (red M&M) to a sandwich. Of course as soon as J saw his sandwich he requested mom to sing Rudolph the Red Nose Reindeer again and again and again… so be prepared! When I was little my grandmother used to record stories on tape for us. We still have some of them! She also sent some to my cousins who were overseas at the time. 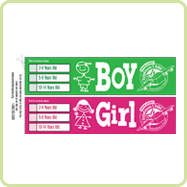 I think this is an awesome gift for little ones that live far away. They get to hear your voice on a consistent basis, acting out your love from thousands of miles away by reading stories to them! A few years ago I took the same concept and made a set of books on CD for my nephews (age 2 and 3 at the time). I chose some favorite books from childhood and recorded myself (and my husband) reading them using my computer. I used a free recording software called Audacity. It worked well. Their software was easy to use and easy to edit. I later went in and added a little chime sound for when the page should be turned. The software made it easy to dub the chime to my saved recording. Just Google “free sound effects” to find a wide array of choices. Finally I burned all the stories onto a cd, made a cute little cover for it and packaged cd and books together for my nephews. We also recorded some fun family stories and songs and I added a few stories from my grandma and grandpa (using the tapes they gave us as kids). I should add that I am not a technological expert by any means. I have trouble with Facebook! 🙂 I guarantee that if I could do this, anyone could. It really wasn’t a difficult project to complete and I think it’s a great gift. I recently burned all those same stories onto a cd for J so it’s become a gift that keeps on giving! It’s been great to use on road trips and plane trips. It also works great while cooking dinner. If you’re still deciding on a Christmas gift for a little one in your family, you should try this out! We dropped off our shoeboxes today. 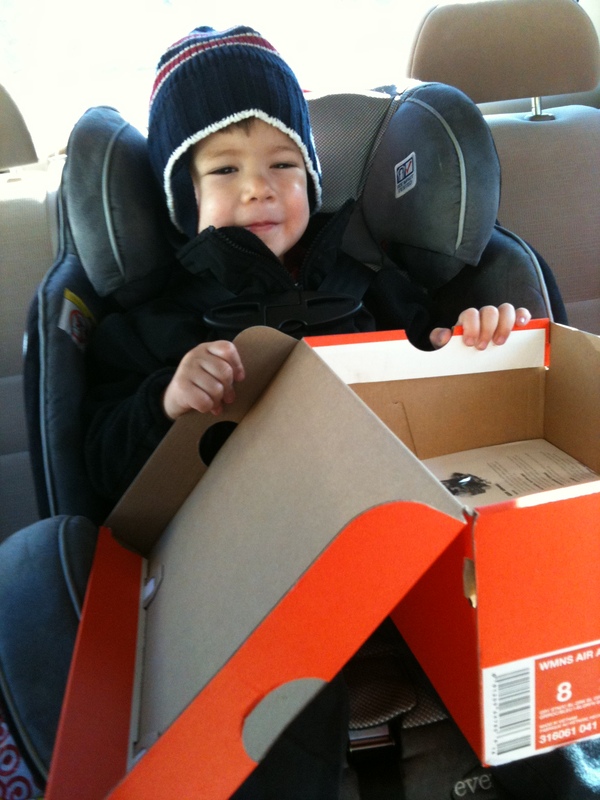 Look at the excitement on J’s face when we were ready to load them in the car and give them away! You have until Monday, November 22th to drop off your box. No worries, you have plenty of time! You can find a drop off location near you by typing in your zip code here. If you haven’t started but would like to get your little ones involved, you have time! It really doesn’t take long to put them together, even on toddler time. If you haven’t heard about this great opportunity to teach your little one the blessing of giving, check out my other posts here and here. Or check out Operation Christmas Child’s website. Shoeboxes for Operation Christmas Child? Check! I wanted to post about our experience filling boxes for Operation Christmas Child. This really was a perfect way to help my 2 year old understand the concept of giving. See this post if you want to know more about the opportunity to give! PREP: We made filling shoeboxes a family event with my husband, J and myself, starting by watching the videos I mentioned in the last post. Veggietales’ Operation Christmas Child is 3 minutes long and “Give This Christmas Away” is almost 5 minutes. They are great videos to help show the concept of Operation Christmas Child to little ones. We talked about how happy the children were when they opened their boxes and how happy the children that made the boxes were. Basically we got him excited about filling a shoebox with goodies for a little girl/boy somewhere in the world, focusing on how it would make that child feel. We talked about what type of things we should put in the boxes and had him come up with a few things on his own (cars and balls!). 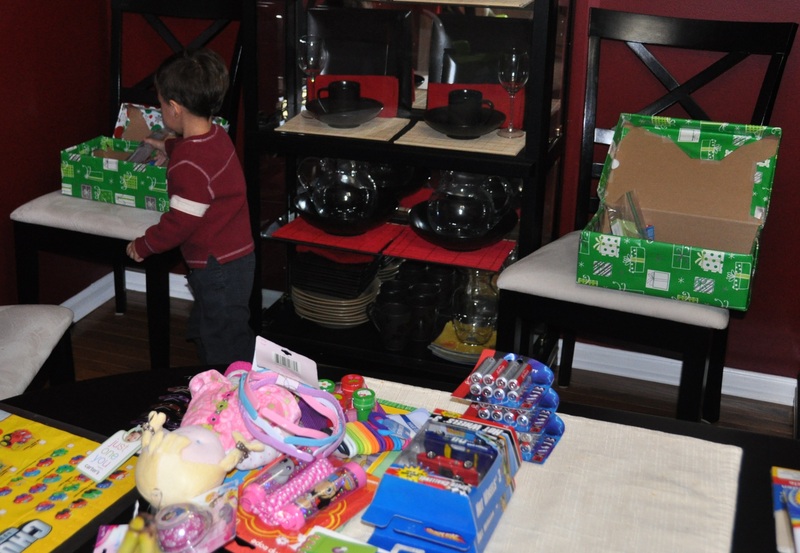 Print off this list of items to consider from Operation Christmas Child to help. We pulled out our shoeboxes and pointed out that they were empty! We needed to fill them with fun things for little boys and girls. J is ready to fill his shoebox! to fill it up! For younger ones, I would really suggest bringing the empty shoebox to the store with you. This really helped J focus while we were shopping. We went down the aisles to look for things little boys and girls could use. He never once forgot the purpose of our visit. Each time we pulled something off the shelf, he placed it in the shoebox. It was fun to watch the shoebox fill up! Your Turn! You still have time to put together your own shoebox of goodies! I was reminded of this event last Thursday and we had it completed by Sunday with no rushing and lots of fun. You don’t have to mail the boxes yourself, just drop them off. Click here to find your nearest drop off location. 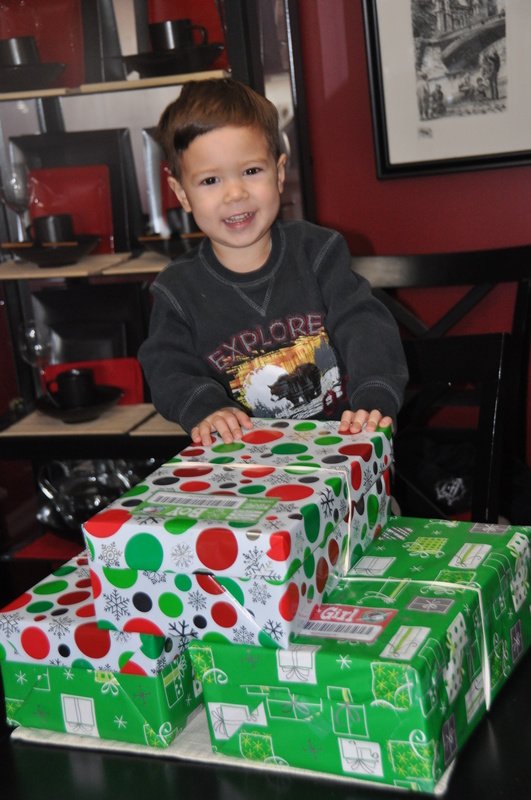 You can drop off your shoebox between November 15-22. Plenty of time to join in! I saw this cute Thanksgiving countdown and had to try it. I adapted it a little so that I could reuse it every year (or at least for a few years). I used foam and cardboard instead of construction paper and cardstock. I also made it magnetic and keep it on our fridge. Our turkey actualy isn’t this full yet, I just took a picture of what he would look like in all his glory. J adds one feather to Mr. Turkey each day. You could do the reverse and pluck a feather each day, pretending to ready him for Thanksgiving dinner. I think older kids would find that really funny actually. First check out the original site if you like to change things up each year and are ok with a temporary version. I liked how she made the head 3D. Since J is so young I know that this will still be exciting for him next year. My materials: colorful foam, cardboard, googly eyes, adhesive magnets and glue. It took about 30 minutes to make, but could be done much faster since I had to redo things a few times or find new materials to work with. This is also something your little one could help make. I just did it during naptime since our week is so busy and wanted it done in time for a decent countdown. 3. Cut two circles out of brown cardboard, a large one for the body and small one for the head. **I suggest having a very large body so you have plenty of room for your feathers to fan out, especially if you plan to start on Nov. 1st. The cardboard circles that come with frozen pizzas work great. 4. Glue the smaller circle onto the larger one. 5. Cut out a strip of cardboard and glue on the back of the large circle. **Place it on the base of the body since the feather strips will be stuffed along the top. (This was my second mistake!) When dry, place 1-2 magnetic strips on the back of the turkey’s body. 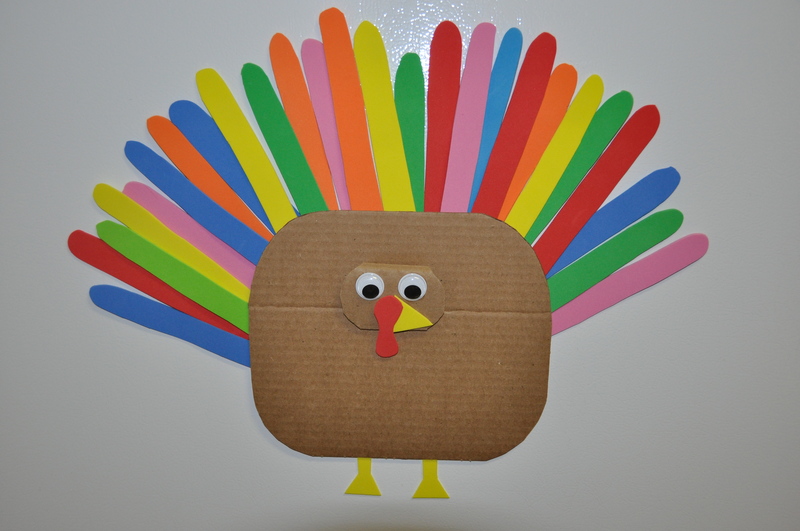 The cardboard backing allows Mr. Turkey to be lifted slightly when attached to the regrigerator. This allows the feathers to slide behind him easily. 6. Cut out the feet, beak, and snood and glue them onto the turkey, along with the googly eyes. 7. Test it out before getting your little one’s excited about it. I’m glad I tested it first since I needed to rearrange the magnets on my pieces. Now we have a cute turkey that J can easily slip a feather behind on his own each day. I am so excited about this! I first heard about Operation Christmas Child last year through a Veggietales video. Of course I didn’t find out about it until the after the deadline to drop off boxes. This year I won’t miss it! I think it is so important to teach J a heart of giving. That takes putting it into practice. Since J is so young, I first plan to show him this video: Veggie Tales Operation Christmas Child story. 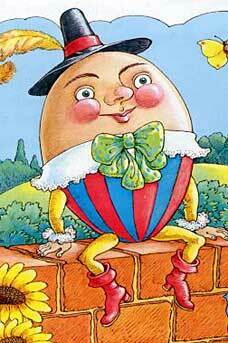 I originally saw this on the St. Nicholas Veggietales video. We’ll talk about the act of giving, make a list of fun things to give other little boys and girls and GO SHOPPING! I’ll be sure to share how everything goes once we’ve packed our boxes, but I wanted to get this info out in case others would like to join us! The week to drop off boxes is November 15-22, 2010. Don’t miss out like I did last year! If you go to Operation Christmas Child you will find all the info you need, including where the drop off locations are for your area. This is something everyone in the family can get involved in! ETA: I wanted to mention that they even give you the opportunity to track your box. You can a barcode online to attach to your box to determine it’s final location. This is a great way to incorporate a little geography and culture to the project! This page tells more about their tracking process. To add to the links for you to check out, please take time to listen to this song, Give This Christmas Away. It will touch your heart and inspire you to find all sorts of ways to give this year. This would be an excellent choice for a winter activity when everyone’s stuck inside! Since painter’s tape is not cheap I tend to leave these up for awhile whenever we set something up for him. And I reuse the tape to make other things (letters, shapes, numbers,…). **ETA: A reader recently shared her adaptation to this activity. It is such a good idea, I wanted to share. She placed the tape onto a blanket so she can now bring out the homemade roads anytime she wants. Check it out here! She also created a cute homemade town around the roads. I found this recipe in the mail from my grocery store and knew it was something J could do with me. I had all the ingredients, so we could do it right away! 1. 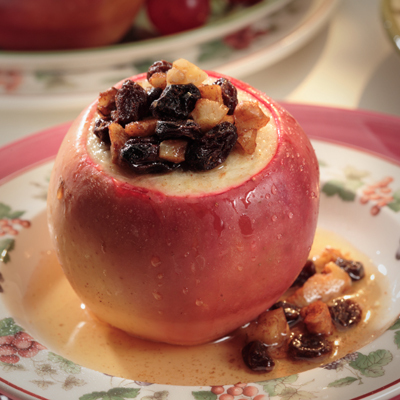 Preheat oven to 375*F. Core the apples, leaving the bottom closed (creating a small bowl in the apple). Peel the top half of the apple. 2. Fill the apple with dried cranberries (I used frozen and it was fine). 3. Top with a spoon of brown sugar, 1/2 tsp of butter and sprinkle with cinammon. 4. Bake for 35-45 minutes (until the apples are soft). J helped with steps 2 and 3 and then of course helped with eating. This was a simple cooking project for him. You can make just one or a dozen. I really decided to do this last minute because I had all the ingredients, no planning required. 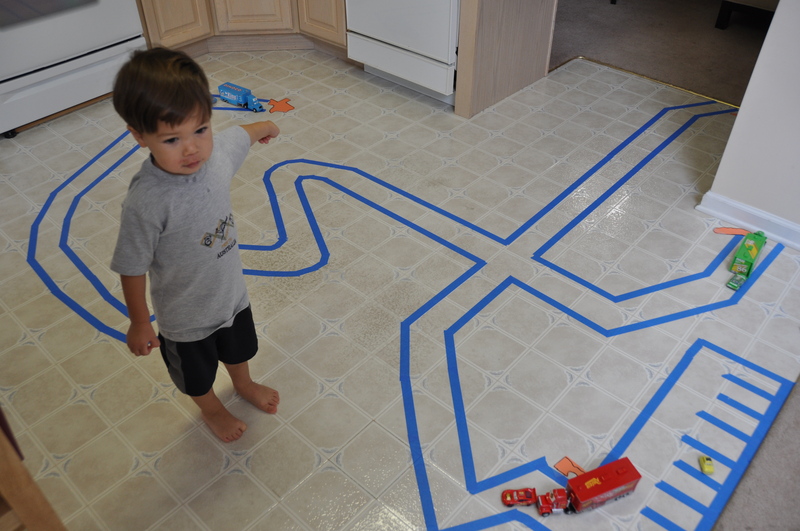 This would be a good recipe for any age toddler, even the youngest could manage this. Preschoolers could accomplish it mostly on their own. You could create a picture list for them to follow on their own. All ingredients are safe for taste sampling if they get distracted while “cooking” and if they were to add more than the actual recipe called for, no harm done! 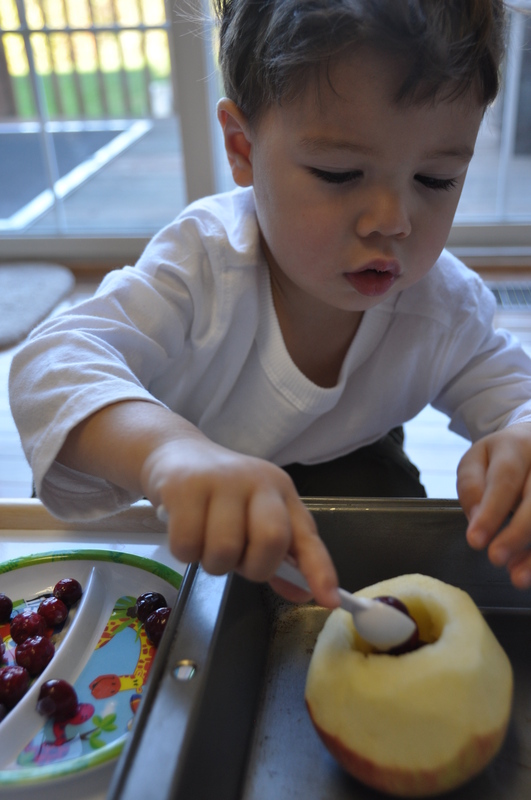 Use a spoon or tongs for adding the cranberries and you’ve included some fine motor skill practice! It’s also a great activity for autumn after picking your own apples!